To make your own sausage, first grind the cold meat by placing it in the hopper of the grinder. Make sure the grinder itself is cold before using it. Mix the ground meat with seasoning and add it to your stuffer. Soak the casings in water per their instructions and slide them onto the funnel. Have a second person turn the handle on the stuffer while you guide the sausage into its casing. Tie the end into a knot and begin to tie off the sausage into links. 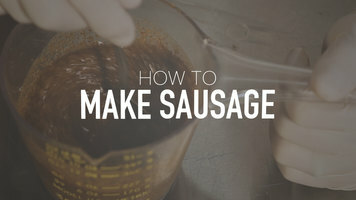 Learn how to make your own sausage with this step-by-step video! What is the benefit of using curing salt with this seasoning? 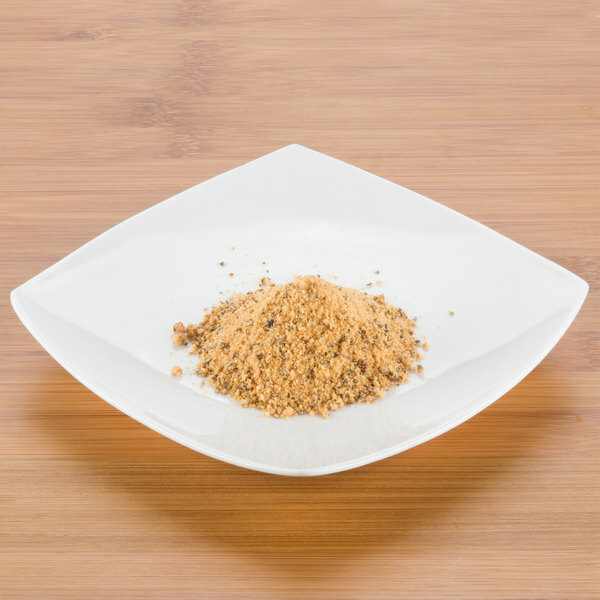 When preparing and dehydrating meats with a spice mixture, curing salt has health benefits. Adding curing salt helps reduce the risk of E. Coli and other bacteria that causes illness. Season up to 10 lb. 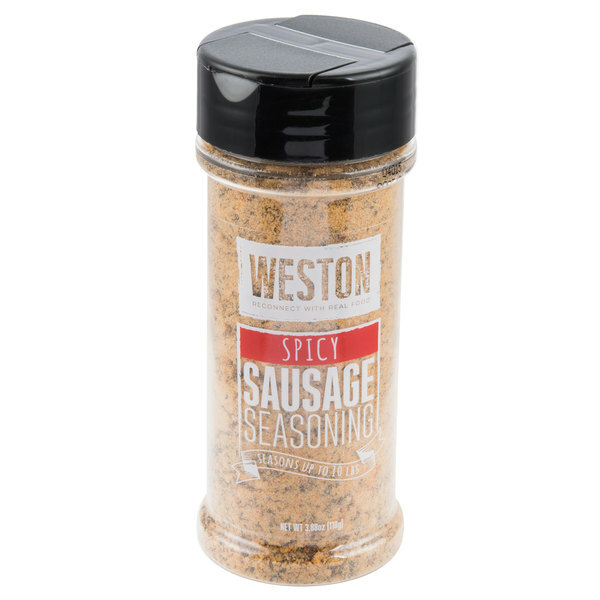 of meat with this Weston 02-0014-W shaker bottle of spicy sausage seasoning! This dry seasoning is made with mustard, spices, salt, and garlic for a hot and spicy kick. All natural and preservative free, it adds flavor to all kinds of meat or wild game. Perfect for hunters, butcher shops, meat departments, and restaurants, this seasoning is pre-mixed to save valuable prep time. Its pre-blended ratio of ingredients and spices also ensures a more consistent taste time and time again. This seasoning comes in a convenient shaker bottle so you can sprinkle the amount needed for your sausage batch and store the rest for later! Just a small amount will kick up the flavor of your meats, as you only need one tablespoon of seasoning for every pound of meat. It is recommended to mix one tablespoon of this dry seasoning with one tablespoon of water for every one pound of meat to ensure an even coating and flavor. Offer spicy sausage on your menu or at your shop with the help of this seasoning, and keep guests coming back for more! 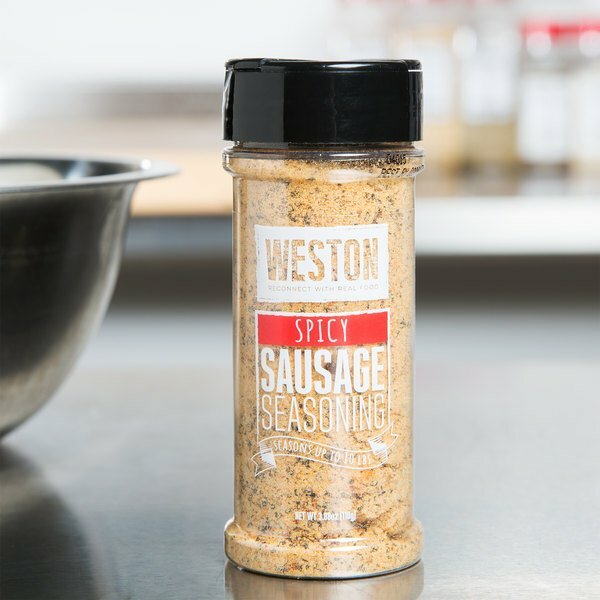 The Weston spicy sausage dry seasoning is a great tool for making our venison bratwurst. The seasoning is bold and hot and really adds a great flavor. The Weston spicy sausage dry seasoning is great. A nice bold seasoning that is great for all types of meats. A nice shaker bottle too. The Weston spicy sausage dry seasoning is a great spice bled. It is perfect for seasoning our homemade sausage and really adds a nice flavor to the meat. This is a really nice and spicy seasoning to have around. It is ideal for using in sausage dishes or other things you can come up with. Great to have around to home or kitchen. Good spicy sausage seasoning for those who do not have time or resources to make their own. Decent kick and a little sweetness as it needs!